Our Firm - Buffam Leveille Funeral Home Ltd.
Our funeral home was established on September 25, 1936 and operated under the name Thorpe and Tulloch. In August of 1965 the funeral home was purchased by Mr Kenneth Buffam. Mr Buffam also operated a funeral home formerly owned by Mr Harry Smart in the Town of Cobalt. 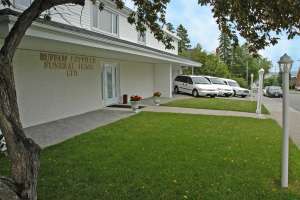 Mr Buffam's son Jack and his family operated the funeral homes until July 1988 when he sold the business to the McDonald Family of Englehart. The McDonald's operated the funeral home until May 15, 2003 when it was purchased by its present owner Claude Léveillé. Claude grew up in this area and was very happy to return after having worked with various funeral homes across the province. Claude and his staff are proud to continue a tradition of service and trust and feel very privileged to serve the families of this area.